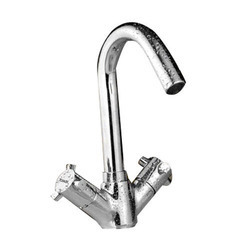 With sincerity and hard work of our professionals, we have carved a niche for ourselves in this domain by manufacturing premium quality gamut of Center Hole Basin Mixer With Swinging Spout. We are counted amongst reckoned names in the market, devoted towards providing an extensive series of Central Hole Basin Mixer. Leveraging the skills of our qualified team of professionals, we are engaged in providing Fancy Center Hole Basin Mixer. The Center Hole Basin Mixer offered by us is known for its aesthetically pleasing designs and durability.